Suggest that your munchkin go for a Burberry babys toddlers mini jaxson bomber jacket from Saks Fifth Avenue and grey jeans for a laid-back yet fashion-forward outfit. Grey sneakers are a smart choice to complete this ensemble. This combo of a Burberry babys toddlers mini jaxson bomber jacket and brown jeans has all the potential to become your little one's favorite. Dark brown boots are a good choice to finish off this look. 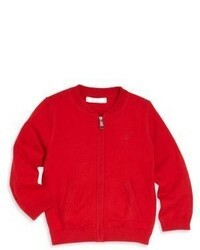 A navy bomber jacket and red shorts are a nice outfit for your little angel to wear when you go on walks. 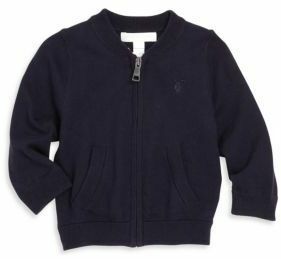 Suggest that your little man reach for a Burberry babys toddlers mini jaxson bomber jacket and light blue sweatpants for a fun day in the park. Blue sneakers are a great choice to finish off this style. Suggest that your boy wear a Burberry babys toddlers mini jaxson bomber jacket with grey shorts for a laid-back yet fashion-forward outfit. Navy and white sandals are a good choice to complete this ensemble.